Currently The Duchess of Cornwall's favorite pick for day-to-day wear, these earrings feature a pierced round pearl pendant hanging from a detailed silver-toned disk. It appears there may be some type of stone in the top portion, but it's difficult to tell. 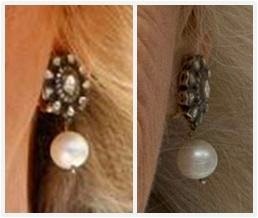 It's doubly difficult to see the details because in regular use, you can't see the top portion of the earrings anyway. They remain covered by The Duchess' signature hairstyle, and are primarily identifiable by the round pearls which just peek out from below her hair. These are currently her everyday earrings, worn to most engagements, but they're worn to some evening events too. They were also her pick for her civil wedding to The Prince of Wales on April 9, 2005. Appearances: These are, as stated, worn nearly every day. Individual appearances will not be listed separately, but those that have been covered on this blog are tagged and can be seen by clicking here.